March 4~11... what a crazy, crazy week. The rate of problems and solutions flying through my brain throughout the week was pretty overwhelming. Tiring sometimes, but at the same time exciting to try to find hacks that could manage so many features and content in such a short period. So. many. hacks. The technical debt is real! I was cringing as I wrote much of the code, but had little choice--take the fastest route possible or risk failure. For the first few days I was doing a slightly cleaner job of it, but with the deadline looming I started getting really crazy as the week progressed. 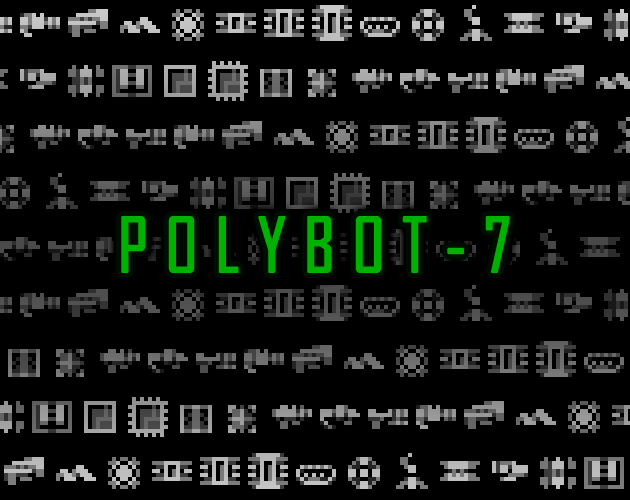 This is my in-depth postmortem covering POLYBOT-7's development, examining both the process as a whole and the reasoning behind choices made along the way. After thinking on it for a while it started to feel kind of boring, though. This is 7DRL! 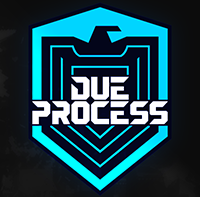 It should be about experimentation and interesting new roguelikes! I had to get more radical, and just about the time I was thinking this I was also skimming my notes for upcoming Cogmind features, one of which happened to be a top secret "Katamari Challenge Mode" I wanted to release with a big Challenges update later this year--basically the player would act as a magnet for nearby items. This suddenly seemed like a great core mechanic to build into the 7DRL, not to mention the ideal design would require a ton of other changes to go along with it, essentially creating a significantly different game within the same world. A 7DRL could do much more justice to this idea than a simple Challenge Mode, so this became the new direction. Altogether the proposed changes greatly altered the Cogmind experience, and you can read a list of features similar to and different from that game in the original announcement post, though I'll speak about a few of them in more detail later. There are of course also a few other reasons why I chose Cogmind as a starting point to begin with, not least of all because doing so would mean I wouldn't have to do quite as much planning and preparation, and could instead have more time to focus purely on developing any gameplay or content rather than fundamentals. 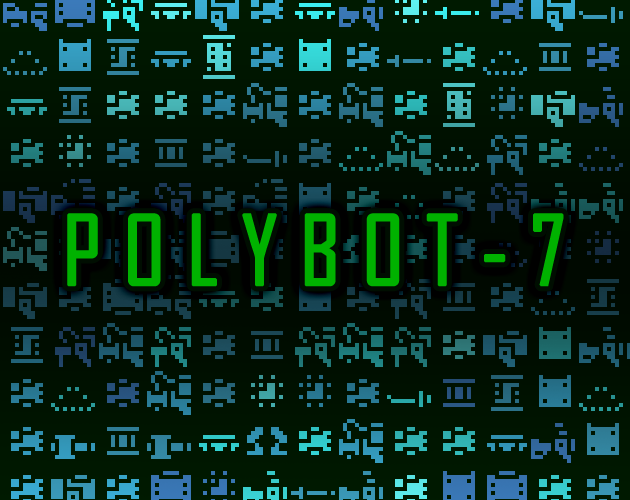 Without a doubt POLYBOT-7 is a better game for it. One of the best ways to tackle 7DRL is by reigning in scope, but another of the best ways is to base your idea on an existing game or at least a well-developed engine or framework. I'm deeply familiar with the source for my games and engine after working with them for many years, and not having to reinvent the wheel here is good because I'm actually not that great with technical stuff--in fact I'm quite slow so that's not something I'd want to deal with under a strict time limit. Things weren't all that rosy, however! Part of why I did worse this year than I could have is that I didn't have nearly as concrete a design ready for me at the beginning of the week. 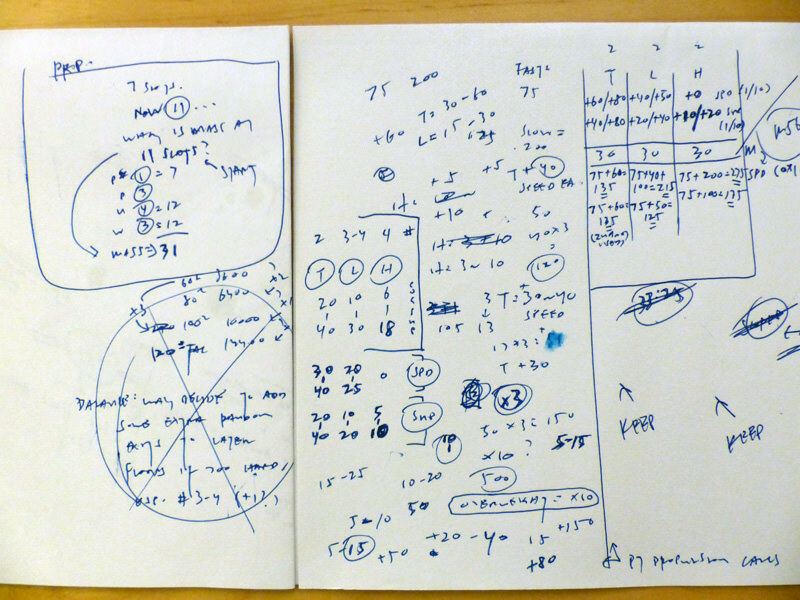 Back in 2012, prior to starting my 7DRL I'd already figured out everything--all the math, formulas, and data ranges checked out, it was just a case of putting it to code and ASCII. For POLYBOT-7 I had basic plans laid out, but many details were lacking, and that's a problem because emerging details can pretty easily cause a domino effect throughout a design. And they did :P. I ended up having to make some big changes and additions to accommodate adjustments to systems I hadn't fully thought through before. 7DRL prep really starts a fair bit before the week itself. I went through several design docs starting back in January, occasionally opening up the latest one to make additions, then when it got a bit messy or I wanted to make a significant change in direction I'd reorganize everything in a fresh doc to get a good overview of the design state. Back in 2012 I had a lot of free time for this sort of thing, though, whereas this year I was pretty busy with Cogmind dev and other stuff, so didn't have as much design time as I would've liked. I went into 7DRL with a technically complete high-level design doc, though given more time I would've refined it much further. 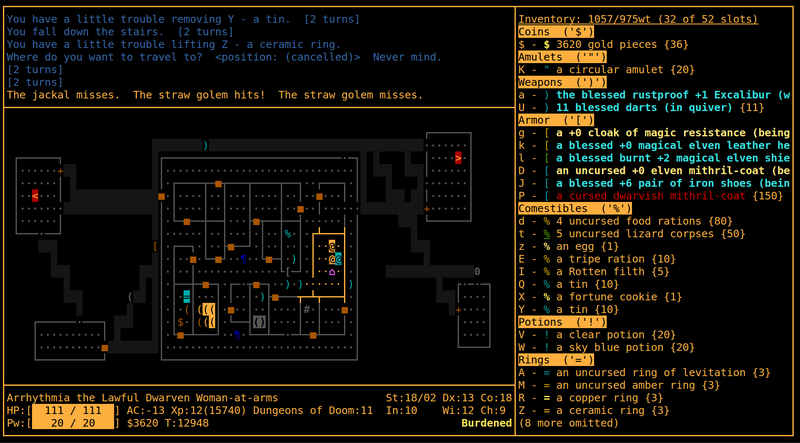 Before the 7DRL I also wrote the release announcements for both this blog and itch.io :P. I'm actually a fairly slow writer and knew there wouldn't be time to prepare good release announcements during/at the end of the week. I did end up having to make a few modifications later based on changes to the design, but for the most part it stayed intact, all I had to do later was put together some quick screenshots. Plus this was also a good opportunity to familiarize myself with itch.io, which I'd never used before and it would be funny to somehow screw up releasing the 7DRL when it was already done! 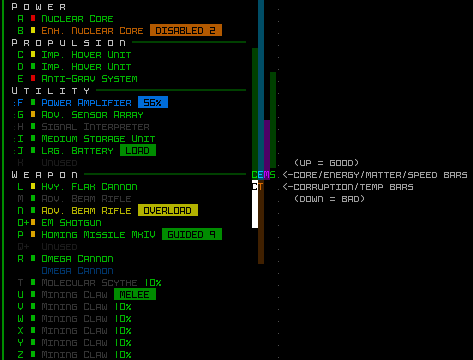 In addition to design docs, I also spent a little time in REXPaint doing UI mockups. The initial focus was making sure I could fit everything I needed into a 106x30 grid, and I tested this early because I knew the restrictions would probably impact the mechanics. It was also important to consider ways to adjust the overall appearance to create something as distinct from Cogmind as possible. One of the easiest ways to do that is with color, so of course my first thought (and Kacper's, separately :P) was to move away from green and try out a different main UI color, specifically orange. Gold on black is a cool theme, as you can see in this inspiring DynaHack screenshot. 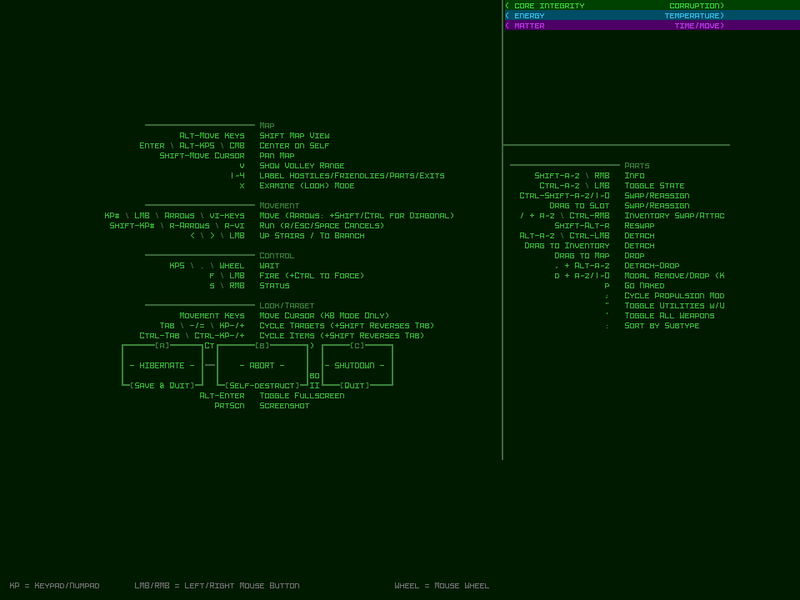 Sample screenshot of DynaHack with a modified color scheme. I explored the idea in REXPaint, but unfortunately from an overall UX perspective orange really isn't all that suitable given POLYBOT-7's mechanics. 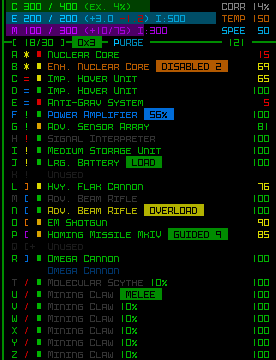 Like Cogmind of course item destruction is a major feature, and the whole color scheme is geared towards green being "good" while other effects and states use their own logical colors. In most cases anything not green probably deserves closer attention. This also preserves the standard "green -> yellow -> orange -> red" progression for damage indicators and labels, a theme applied consistently across many parts of the interface. 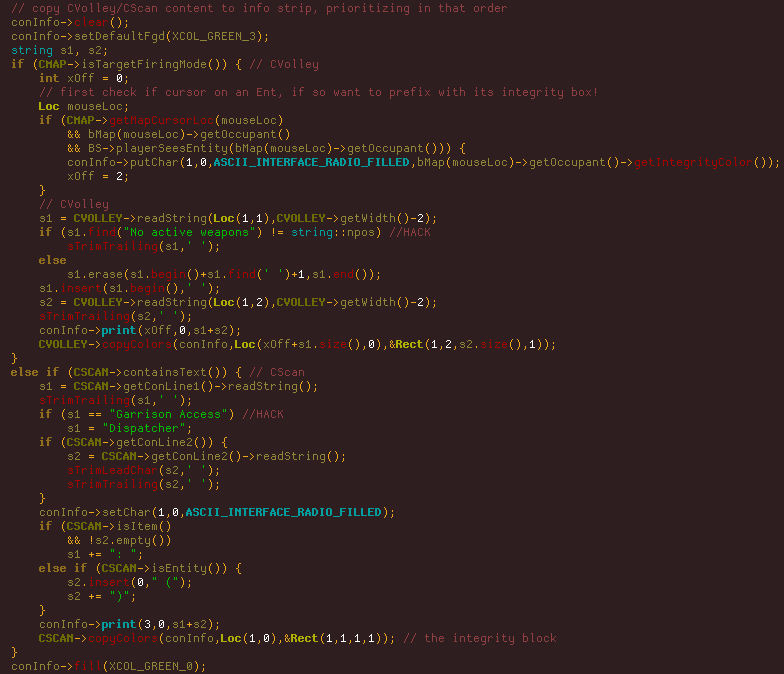 Changing the main color would mess with that intuition and make the UI at least somewhat harder to parse. I made some other adjustments later, but we'll get to that. In any case, once a REXPaint mockup lays everything out as clearly as it does, implementation is fairly straightforward so having this ready beforehand was very useful. Also with regard to color, I decided that rather than once again going for the same old high-contrast black background style, I'd switch over to a low-contrast theme that relies on a slightly darker foreground on top of a slightly brighter background. 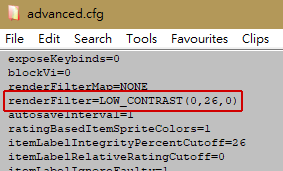 Late last year I added "render filters" to my engine (described earlier on the blog), which make enabling a low-contrast look as simple as changing a config setting. At the time I didn't know I'd end up using it here--the system was just meant to provide Cogmind players with a way to tweak their interface, but it sure came in handy! That line in the config file is what keeps the foreground from being too bright, while also adding a green tint to the entire background. However, the low-contrast filter itself is a pretty big hack, and as one might expect, Cogmind having been designed all these years with the assumption that the background is black meant that the mode doesn't always look perfect in combination with the animations. While there certainly wouldn't be time to update the huge number of particles used for weapons, I could at least get the UI looking better. These changes were all made to Cogmind (which benefited in several ways from this 7DRL :D), something I wanted to do eventually but in this case moved up to before the 7DRL. There were basically two types of issues to resolve: either forcing a background meant to be black even in low-contrast mode, or modifying animations to lerp from a given color to the desired background color rather than assuming black. An example of the latter case, notice how before the fix the animation lerps to black rather than the proper color (effectively going to black before snapping back to the right color), and looks much better (as intended) after it knows the proper target color in the first place. Fonts were also something I thought about a lot before starting. I wanted something simple--both in terms of appearance and implementation, so I went with Terminus for both the text and map, because it's a nice and readable pixel-perfect monospace font available at pretty much all sizes. But because I didn't want to have to provide a massive range of sizes like I do with Cogmind (it takes forever :P), instead of allowing the map view (and HUD) to expand vertically it is locked at 30 rows. The width is still variable, resulting in letterboxing on some displays. This is a much prettier option than scaling, in any case, allowing both text and tiles to retain their pixel-perfect look, straight from the bitmap. It also means the entire range of resolutions can be pretty well supported with only four different sizes, all created from a single base size. With a base square map tile size of 12x12, a 768p resolution uses a 24x24 font (simply created via 12*2), by far the most common 1080p resolution uses a 36x36 font (12*3), and beyond that there are also size 48 (12*4, 1440p) and 72 (12*6, 2160p). Text uses half-width cells that also need four sizes, based on base dimensions of 6x12. 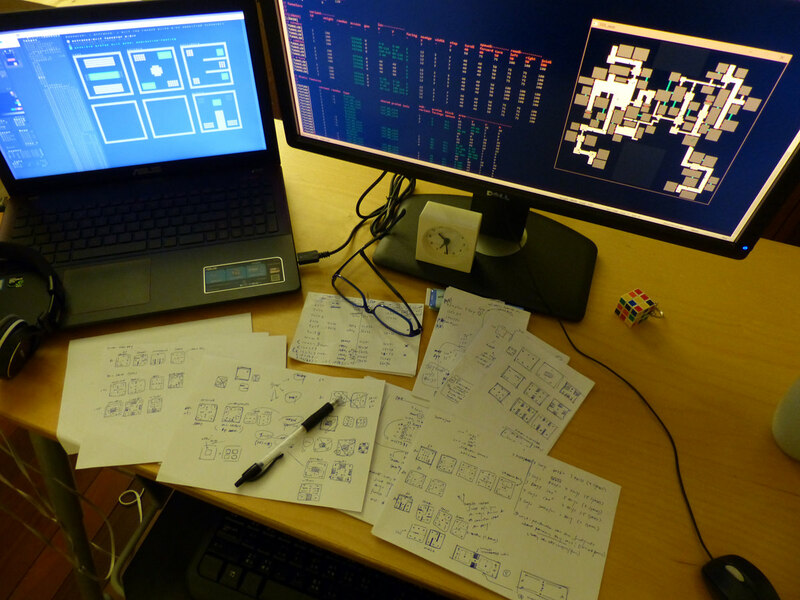 The main goal of the design was to create a quick, very coffeebreak-length Cogmind-ish experience, so everything revolved around that. There should be fewer decisions involved in a normal playthrough, and thus many systems or interactions would need to be removed. And not just systems but even weapons' visual effects, which are blocking and therefore can slow down the player. With that in mind, during the week I wanted to tweak any slower animations, or outright remove most weapons that relied on them. Another huge decision-saving move was to completely remove the inventory, though it took some time to come to this conclusion. 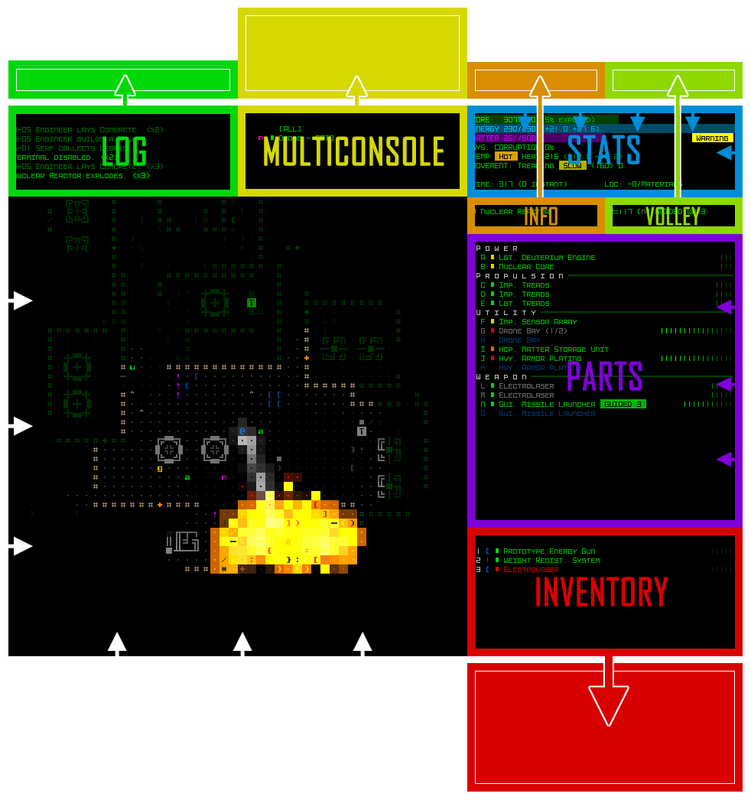 Notice the inventory in mockup #2 above, which was at first envisioned as a modal window that would allow collection of parts to then attach at will. Time-consuming! Even with all the supporting automation features it provides, one of the more time-consuming aspects of Cogmind is inventory management, and I thought it'd be great to limit that. So the next thought was perhaps an ordered "queue" of parts that would be attached next after you lose some, but even that seemed too complex for what I wanted to be a simple, focused game. It dawned on me that there really wasn't a strong need for an inventory at all--basically the world was going to be the player's "inventory," facilitated by the already established ability to quickly attract surrounding parts. This would be both simple and have lots of interesting implications for play. Once attached, parts cannot be individually removed because that would make it essentially pointless to automatically attach parts, with players just removing those they don't want while others are nearby (more tedium!). So aside from losing one to destruction (a slow and unreliable method), there needed to be a different way. Enter another key part of the plan: the "Purge" mechanic. Cogmind already has a "go naked" command that destroys all attached parts to allow for a quick getaway in certain emergencies, and it seemed like repurposing this for POLYBOT-7 would make it a much better game. Instead of destroying all parts, it could destroy a random half of them and drop the other half, allowing the possibility of keeping some potentially good parts while also not requiring that there be a massive number of parts nearby to return to full slot usage. This mechanic would allow players to "shuffle" their build if 1) it became totally imbalanced and unusable or 2) they found some really good/better items that they want to take advantage of right away. The first stretch of 7DRL week was an exercise in chopping up and reconstructing an existing UI in the most efficient way possible. UI-first would be the best approach, since that would enable me to work on the display with the game content (initially equivalent to Cogmind Beta 5) remaining a known variable throughout that process, speeding it up. 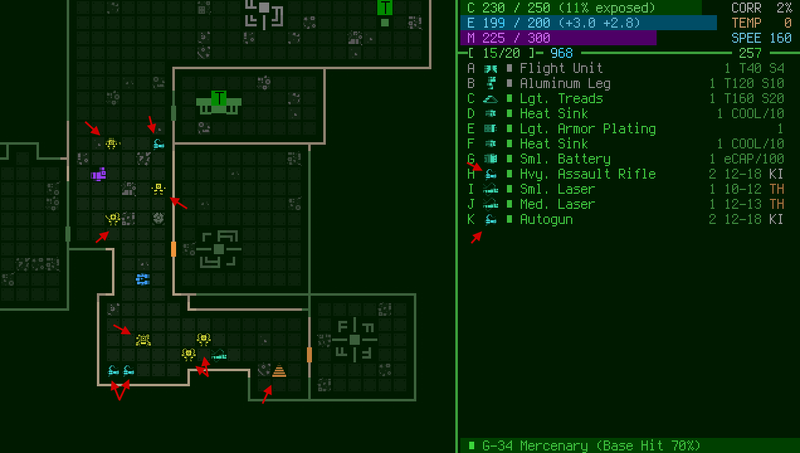 The default Cogmind UI layout, with arrows showing how consoles were either moved out of view or shrunk down for POLYBOT-7. Hackish? Very. Easier than the alternatives? Hell yeah. I also blocked the commands that would otherwise interact with contents of those windows. So technically while playing POYLBOT-7 there are a fair number of consoles that actually exist and are updating all the same, but aren't drawn to the viewing area because they're positioned off the screen. Cogmind already has a system for printing the combat log (separate from the message log) directly to the map, so I instead hooked that system up to the message log itself--bam, messages now temporarily appear over the map :). Though I did have to alter its behavior to always scroll downward, and shift older messages up, rather than the cyclical approach used in Cogmind (which I might go back and replace with this new one, not sure). Sample log messages scrolling over top of the map. But we can't have messages staying there forever, covering part of the map, plus we need a way to review older messages anyway, so we still need an interface to provide that functionality. For that I came up with the idea of simply reusing Cogmind's "full message log." In the original, pressing F4 expands the message log to have it stretch all the way to the bottom of the screen, showing many more messages for faster parsing. In POLYBOT-7, pressing 'm' both repositions the log window so that its top left corner is at (-1,-1) relative to the screen (to hide its title/borders) and expands its height so that the interior covers the map. Closing it with 'm' or Escape (or a click) then shrinks it again and moves it back up out of view. The message log originally spanned only half the width of the map, as in Cogmind, but I later widened it to match the map width and cover it entirely when open--may as well since there's room and it makes messages easier to read by requiring fewer newlines! Opening the expanded message log over the map. Note that later I decided to keep its borders visible since it looked better given the way the fonts work (otherwise letters appear right up against the edge of the screen). As seen in the earlier layout adjustment diagram, the "Scan" and "Volley" windows (used to get an info summary for the object under the cursor, and attack details, respectively) were both moved out of view, but the info they contain is way too useful to not have it somewhere easily accessible. The "info strip" at the bottom of the parts list, showing summaries for different objects/states. I didn't add this particular interface feature right away (notice it wasn't part of the original mockups), but later on after just a little testing realized that sacrificing a potential item slot was worth it! You can see the entirety of the info strip code here, a very messy, quick hack job like everything else done during the week xD. It's copying text from other consoles and somewhat reformatting it as necessary to show in the new area. First came one of the main new features: part attraction. This wasn't too hard to get running because for a long while now there's been a particular special feature in Cogmind with a similar effect, so I could just adapt that code. A Dijkstra search is performed from the player's location, finding all parts within range (4), and each uses pathfinding code to attempt to reach the player, one move per turn. Tactical positioning was always important in Cogmind, but with this it becomes even more vital because optimal play must also take into account relevant item locations, including even potential drops from enemies which if too close might fill empty slots with inferior parts! The part that attaches is randomly chosen from among those adjacent to you, making it even harder to construct a specific build if already wading through items. And parts cannot be removed individually, which would otherwise just invite boring tedium. Attracting nearby parts and letting them attach. Cogmind has Recyclers to take care of this job by carrying salvage off to insert into Recycling Units, but there was a clear decision to use only combat-related bots in POLYBOT-7. So I again repurposed an existing Cogmind system to handle this need: item self-destruction. In Cogmind this mechanic is only used in special cases, but here it would need to be universal. All items dropped as salvage from a robot start their own turn counter, and when their timer is up, the item destroys itself. Each leaves behind a little bit of matter, which is both useful (as ammo) and looks cool (you can still see remnants of a battle or group of parts). Passing turns to demonstrate parts self-destructing because the player's slots are full. Obviously there still need to be good parts lying around for the player to find, so those don't have a timer until the player starts attracting them. And to avoid allowing the player to "drag parts" around a map as backup for too long, any parts that are actively being attracted have their timers count down twice as fast. As a bit of QoL, items glow a bit once their timer is active, and even faster if their timer is approaching zero. That system can use some improvement but I didn't have much time and it's only of secondary importance anyway. Although there are no type headers anymore, parts are automatically sorted while also showing their ASCII/tile to the left, making it easier to quickly tell how many of a given type are currently available. Another key to simplifying item interaction and build management was allowing multiple forms of propulsion to be mixed (unlike Cogmind where only one form can be active at a time). Simply allowing mixing was easy enough, but the whole propulsion system would become really clunky if the old mechanics were kept but multiple types could be used at the same time. There was just no way around it, the entire propulsion mechanics would have to be redesigned from scratch! In the design doc this was originally on my list of "stuff that would be nice but I won't have time for," so finding out partway through the week that I really did need a new propulsion system got me worried! To be good, a system like this would likely need to go through testing and multiple iterations, thus clearly not suitable for 7DRL. So hover retains speed without being able to provide much support, legs slow the player down a bit but provide a bit more support, and treads slow the player down even more but provide a lot of support. Conceptually it sounds more or less like Cogmind, although the math in Cogmind doesn't allow for type mixing, and is more complex because it supports other features like overloading (removed for P7) and propulsion that increases base speed (also nonexistent in P7). The extent of my propulsion implementation preparations. POLYBOT-7's propulsion mechanics are based entirely on a bit of quick napkin math, rather than proper spreadsheet analysis and testing. Fortunately I didn't have to make any changes to the system at all--it seemed to pretty much balance out in practice! I didn't even need to change any of the item data templates from which the 54 new propulsion items were derived. Whew! "The Gauntlet" rebuilding its structure. It would be nice if the animation were faster--it's basically the slowest part of the game (which if you recall I wanted to be fast to play), but I was working quickly and didn't want it to be without sfx (seeing as everything else is audible...), and the only appropriate sfx I had lying around was that long... so I matched the blocking animation length with that. At least it only actually does this if any terrain has been destroyed since the last cycle. Earlier I mentioned the importance of finding ways to modify POLYBOT-7's appearance to differentiate it from Cogmind. It plays very differently, so ideally its appearance should be as different as possible, too. We've already got the new UI dimensions, larger pixelated fonts, and color changes, but there are also a few other ways this was achieved. Oriented line-based walls is an easy and obvious one, and it just so happens that Cogmind still includes code to apply that style (originally from the source code's [email protected] days :P). While it was easy to flip that switch, it also hasn't been flipped on in many years so of course it wasn't fully functional... After the bugs were fixed, it also had to take into account oriented doors, a new feature which ended up requiring some hackish code to quickly implement, and even then I didn't quite get to perfect it (the map rebuilding system doesn't always rebuild doors correctly xD). 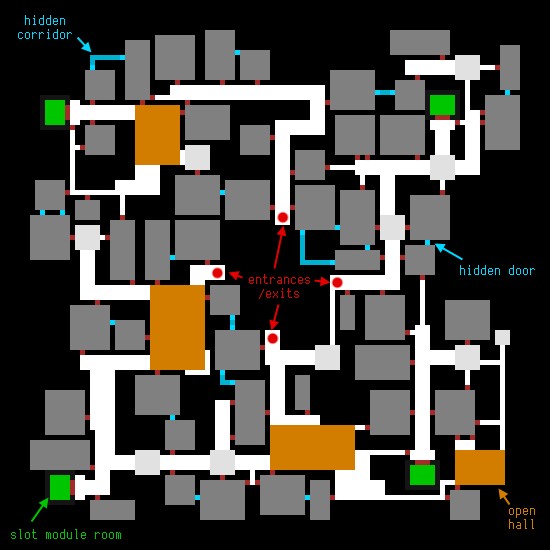 As a side-effect of a simple oriented walls implementation, you can get more information than one might expect regarding what's just behind a wall, though in a robotic world this can be explained away with some logic and I left it that way to allow observant players to make inferences about the layout. I did, however, have to spend a while updating the system to ignore connections with hidden passages/doors, which would otherwise render them pointless. 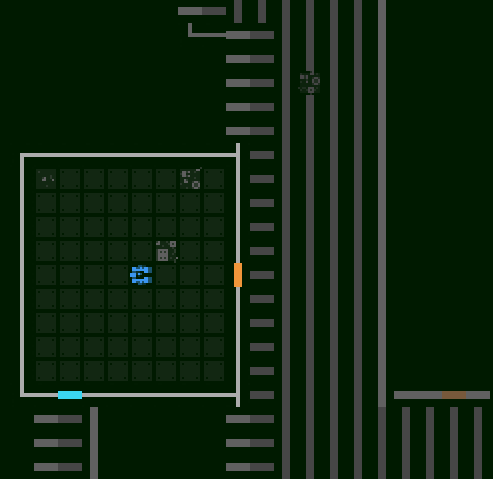 By the end of 7DRL there was still at least one anomaly there which would take much longer to properly address, so I didn't do anything about it: hidden corridors connecting at the corner of a room would essentially give themselves away. The orientation system had become somewhat complicated already, and accounting for special cases like that would've required much more work than the simple rules I set out. As you can see in the shot above, floors were also changed, using thick dots instead of full-size floor tiles. This helps the foreground tiles stand out even more, not to mention keeps a bit more of the traditional roguelike look (in 2015 Cogmind ended up going with filled floor tiles because it looked kinda different and it's something Kacper wanted to try, which I was okay with since either approach could work anyway). Kacper agreed to join me on the 7DRL by making a tileset, so we needed a new style for that, too. At first the thought was to give him the full 24x24 base cell size, and at the beginning of the week he put together a few concepts based on that size which were then dropped into the game to see what they looked like. A shot mixing new 24x24 tileset style concepts (marked) with the new text (the rest are old tiles not converted for testing purposes). Also you can see the solid floor cells here, which were later removed. The main issue was that I created the text by upscaling a 6x12 Terminus font (for its high readability at all required sizes), so its appearance didn't jive with the more fine-pixeled tiles, resulting in an inconsistent look. So we thought it'd be better to go back to using 12x12 tiles and just upscale them to match the text and give the whole interface a large chunky look. I also suggested going with a pure side view, and generally as flat as possible (Kacper had already decided he wanted to work with fewer shades anyway). POLYBOT-7 mostly-flat tileset, except for robots which use two shades. As you can see in the final style demonstrated in the screenshot below, just like ASCII mode the tileset uses oriented doors and walls, and "earth" (filled space behind walls) was converted to a simple square. This both creates a distinctive look as well as kept the tile requirements as low as possible to make sure Kacper could finish (or at least spend more time on what was really important!). Another pretty big change was the item color scheme. I quickly tested a number of different schemes, anything that seemed like it might work or at least had its own logic to it and was worth investigating. This change in particular wasn't necessarily aimed at differentiating from Cogmind, but more as an experiment in how to simplify the UI. Quick testing of different item color schemes in the sandbox (white are unidentified objects in all cases). #3 won. (click on this to see everything more clearly). In the end I liked the simplicity of just blues. They aren't used much in the interface, and go well with "UI green." Even though it's more or less a monochrome scheme, brighter shades of blue could still be used to represent higher rated parts so they naturally stick out more. And blues offer a nice range of associated colors, from azure to sky to cyan. Note however that the player was originally also blue, and this could be somewhat confusing when surrounded by items so at the last minute I switched the player to green, since that color wasn't used elsewhere on the map either (now that neutral bots were removed from Cogmind). At the same time I also changed upgrade modules to be green as well, since they're 1) very important compared to everything else on the map and 2) unique to the player character so using the same color for both makes some sense. 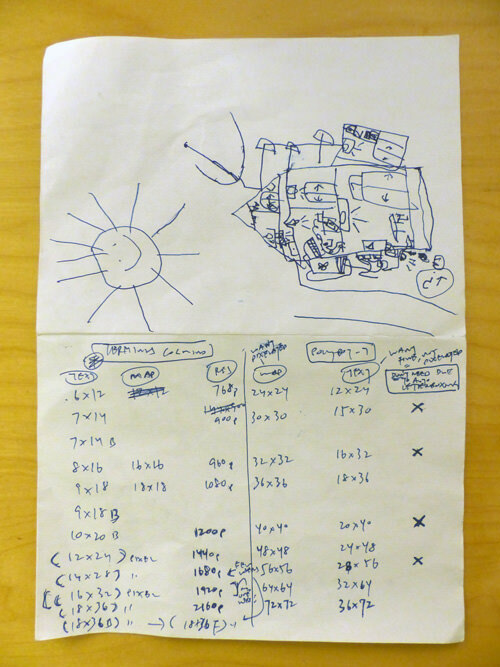 My desk after reasoning through various POLYBOT-7 map layout needs. 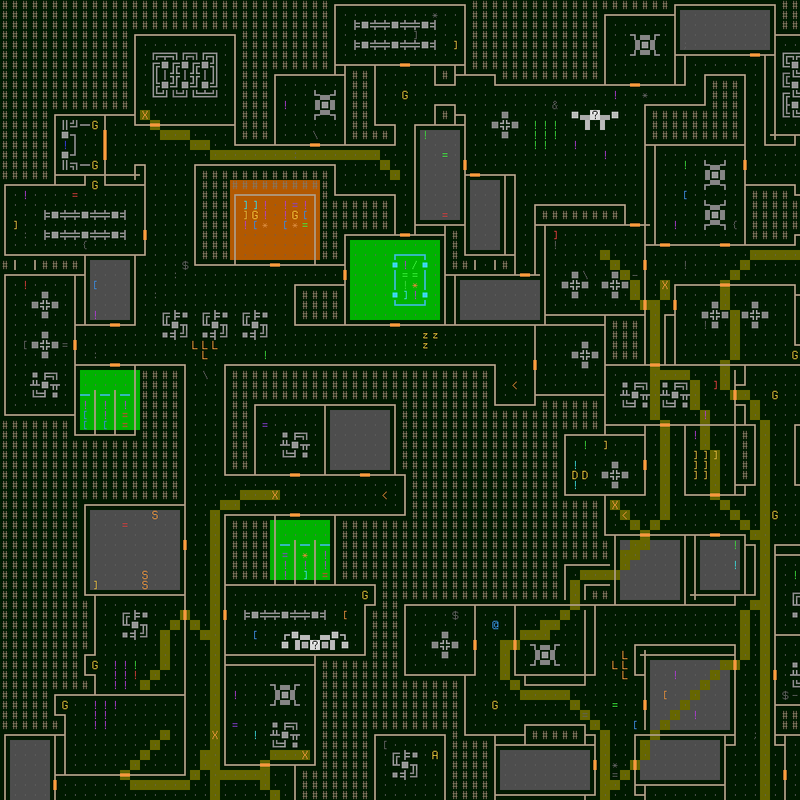 All the maps use my tunneling algorithm from Cogmind, albeit with different parameters. Slot Modules (the way to get new parts slots) are actually among those parameters, existing as prefabs that are deliberately placed in certain locations relative to map entrances/exits. Sample 100x100 map layout, annotated. The player enters from one of the red dots and has to exit from another. 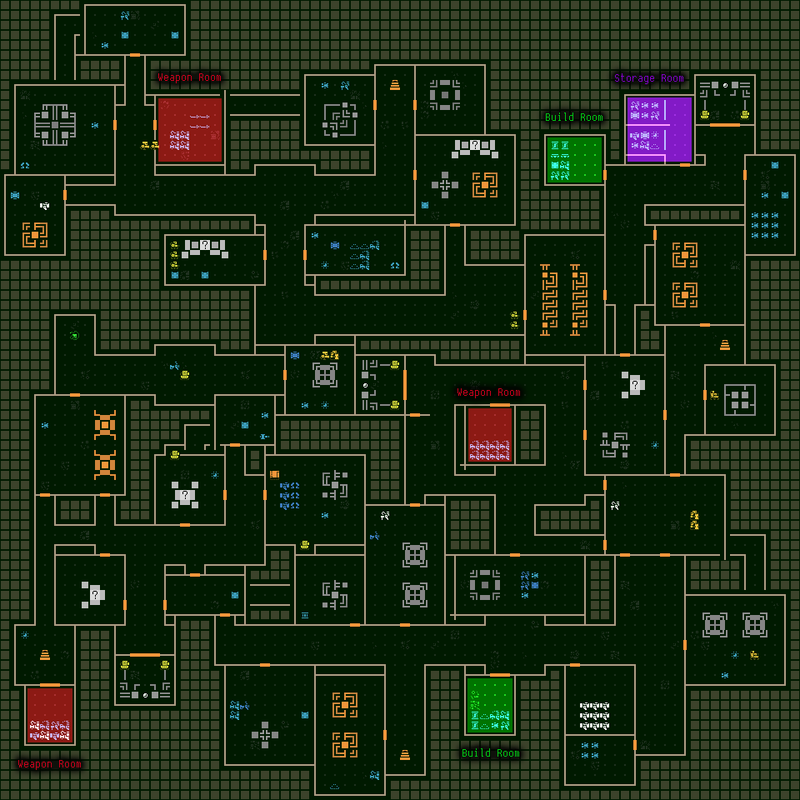 This particular layout has four distributed slot module rooms rather than the usual three, and POLYBOT-7 has a lot more hidden doors and corridors than Cogmind. There are also very few large rooms. I was particularly worried about screwing this phase up because a good set of maps takes a long time to create and there'd be no time to redo this later. 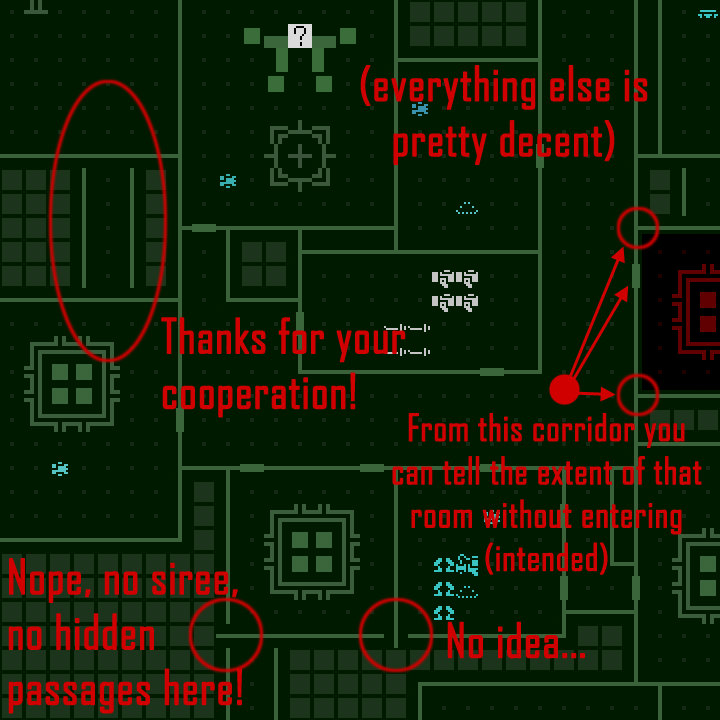 While designing the layouts I based a lot of my assumptions on what I knew from exploring Cogmind maps, combined with plans for how POLYBOT-7's content was going to change everything (the next step in the process, which I'll cover later). Honestly I didn't have to spend so much time on map generation and everything would've been fine, but I wanted more variety to maximize replayability while also keeping it challenging. Map size and layout are understandably crucial to balance, and I'd decided it would be appropriate to increase map size at each depth, meaning multiple different layouts were needed for every floor. So this took a while. Testing layout generation for the 80x80 map (second floor). Testing layout generation for the 100x100 map (third floor). Testing generation for one layout style (each floor has multiple styles) of the 125x125 map (fourth floor). It was during mapgen work that I made a huge change to the game's direction: permanent upgrades. 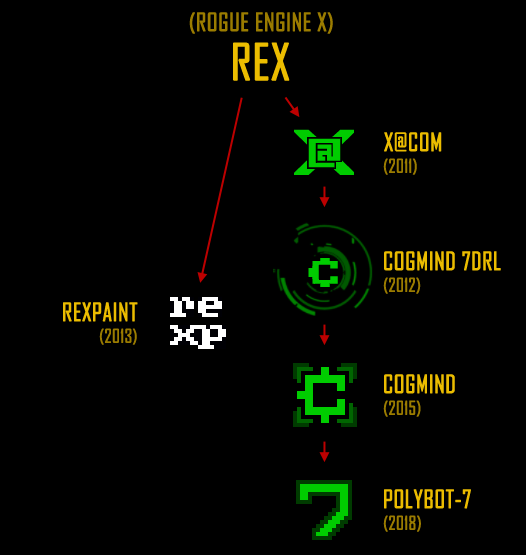 Rather than Cogmind's evolution-based system where you simply have to reach an exit to regain core integrity and get stat boosts, the player collects random upgrade modules that provide permanent benefits like damage resistance, extra energy/matter capacity, greater accuracy or sight range, etc. This is a mechanic I really wanted to explore in P7, but it had originally been relegated to the "probably no time for that" list in the design doc. Little did I know, come the middle of the week I'd be forced to draw on this idea to balance the design. When it came down to it, under the new mechanics map entrances and exits were very difficult to place in the same way I did for Cogmind, since P7 maps needed to be smaller, but all stat upgrades being local to a floor would mean that I no longer have to spread out the exits! Players can locate exits quickly and that's fine, because they'll still want to explore for more upgrades as long as they reasonably can without losing too much in the process, which is where the real challenge lies. What's more, obtaining these upgrades would require attacking Dispatchers (the primary source of enemies scattered across the floor), helping focus on the combat-oriented nature of the game--risk fighting for upgrades, or leave early. Collecting permanent upgrades is also simply a fun thing to do in games, despite being almost totally absent from Cogmind, so it'd be nice to experiment with that in a Cogmind-like setting. New content or not, everything had to be reworked for the new map view size. 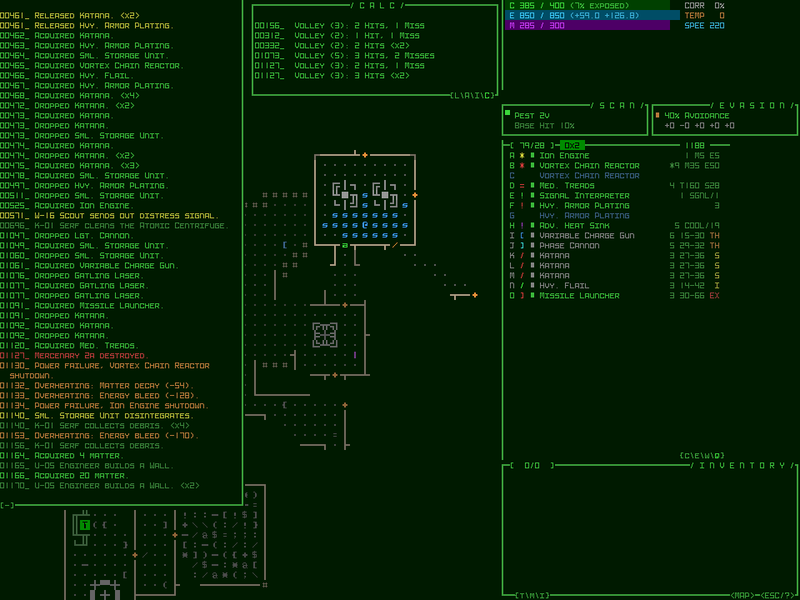 Cogmind shows up to a 50x50 area of the current map at once, and all its mechanics and content are designed assuming those dimensions. Frequently spotting, or being able to shoot (or be shot by), enemies who are off the edge of the map view and require scrolling in order to see/shoot is poor design, so it should be avoided at all costs. At the same time, having items and systems that can take maximum advantage of the available viewing area is also desirable, so you can see how central that view area is to a design. But the 40% reduction would also have a significant indirect effect on firing time. Earlier for the propulsion system rewrite I set the desired base movement speed to be slightly faster than once per turn, and calculated that in practice (based on total loadout mass) players would generally require anywhere from 0.75 to 2.5 turns to move one space--this was intended to keep players from moving too fast relative to the smaller map sizes. And in relation to that, again to retain a familiar balance based on experience with Cogmind, the next goal here would be to choose a firing time cost that gave enemies approximately the same number of opportunities to shoot at a fast or slow moving player as seen in Cogmind. The numbers came out as 3 turns to fire one weapon, 4.5 turns to fire a volley of two. Later testing showed that these seemed to work fine, so they weren't tweaked at all. 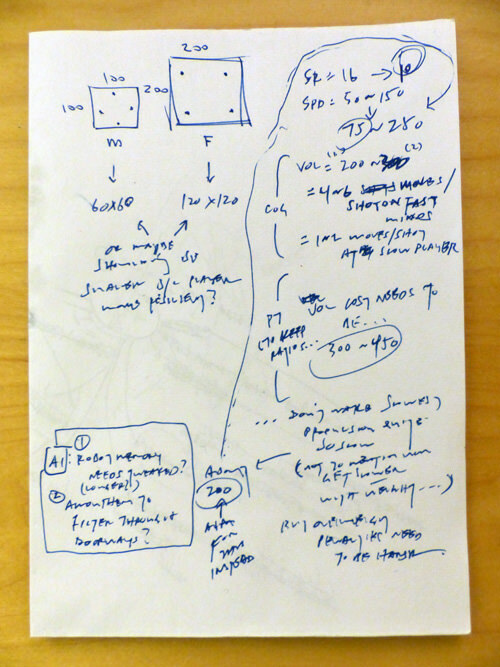 The few notes used to calculate movement speeds and relative volley times, sketched out during the mapgen process to ensure the map sizes would be reasonable for the target movement rates. All (110) Cogmind propulsion items were removed and replaced with 46 new ones (although some of the names were reused, all the stats were reworked). The range of power sources was simplified, removing 23 of them as well as adding a new set of 9 which most of the enemies use (instead of the regular power sources). 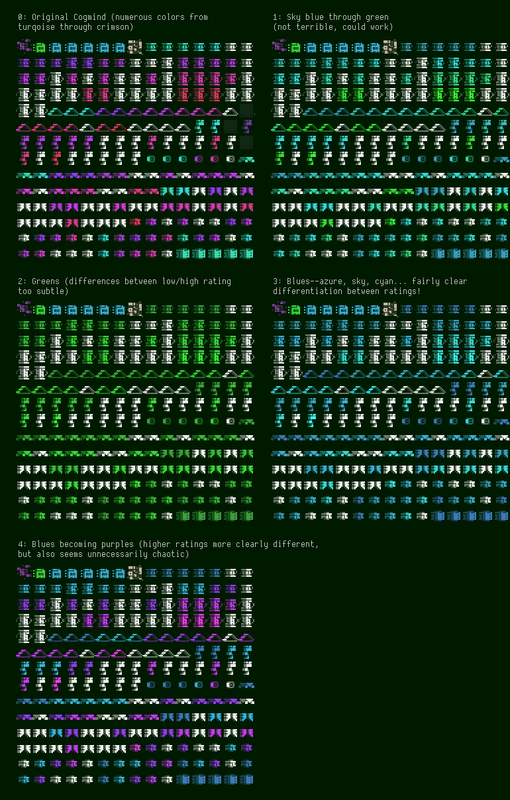 14 upgrade modules were created (at least the behavior code for half of these was available from Cogmind, and the other half was pretty quick to add using a similar model). Utilities were reworked to remove most of those with purely non-combat effects, and simplify the remaining ones to use a more basic naming scheme. 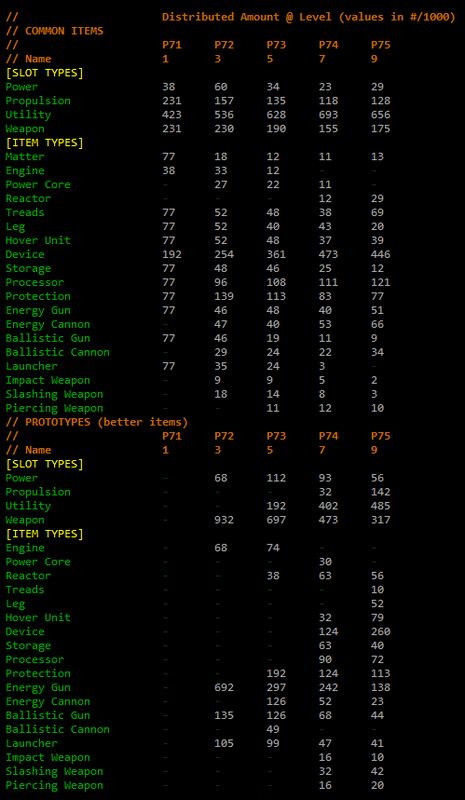 In all, P7 has 182 fewer utilities than Cogmind. Weapon names and progression were similarly simplified, in addition to adding 21 new weapons, most intended for use by enemies. Lots of Cogmind weapons (nearly 200) were removed, and as mentioned before, this process avoided keeping most weapons that used slower animations. One exception was the micro-nuke, the awesomeness of which many think is underemphasized in Cogmind, so I used POLYBOT-7 as a chance to give it the spotlight and make it the best launcher :D. A number of Cogmind weapons were also significantly altered to convert them into better versions of earlier weapons, and had their animations changed to match their new group, albeit recolored. Overall, POLYBOT-7 has only 412 items compared to Cogmind's 900. Once items were done it was then time to put together robots, which are mostly defined by their items. All robots were built from scratch, but in most cases used Cogmind robots as reference templates to guide their design. 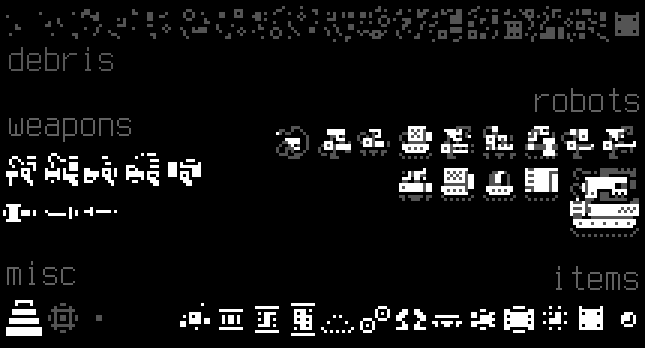 The general idea is that enemy robots use inferior parts, so while the player can attach and use anything, it's often best to avoid salvaged parts when possible (but the challenge comes when there's a lot of salvage lying around and it fills any empty slots for you automatically! This somewhat discourages the "safe" tactic of fighting in doorways). Their power sources also come with no energy storage capacity, so the idea here is that if you rely solely on other bots for power you'll have less reserves for supporting flexible builds. I also gave some robots items they don't really take advantage of but that the player might want, as a reliable way to acquire them. This is a design strategy used a lot more often in Cogmind than with P7, but there were a few cases it's helpful. For example Aimbots carry Structural Scanners so that players have frequent access to a way to detect hidden doors--remember there are a lot more of these in POLYBOT-7! (Also thematically it does kinda make sense that Aimbots, which can attack targets through walls, might have these :P). Once robots were completed (see how all this progresses in a nicely orderly fashion? :D), it was finally time for Dispatchers, the focal point of much of the combat and therefore gameplay experience, including the difficulty! Dispatchers are basically Cogmind Garrisons but with different behavior (activating based on player proximity, timed dispatch of squads until destruction, and dropping modules once disabled), but being a focus of the challenge they ended up requiring a lot of balance work, especially in terms of how far away they might trigger, and how many bots they release. This is something I revisited a few times over the final couple days. Their bots do not, however always directly attack the player! That would be pretty boring, so some of them may stay to defend the Dispatcher, and others will head to the area where the Dispatcher was triggered from, but technically never seek out the player directly like some squads in Cogmind might. With content more or less finished, I moved on to overall map balance. This is where I'd spend time repeatedly loading random maps and looking at them in a zoomed out view to examine distribution of items, patrols, sentries, Dispatchers, etc. and tweak a lot of spawning numbers/ratios as necessary to create something close to what looked like a balanced experience. Examining content across a section of map, including patrol paths (the colored lines). To simplify the overall execution, I made it so that losing any NG+ run causes the player to perma-lose the streak and have to start over from the beginning with a "regular run." Basically roguelike permadeath but for New Game win streaks. This isn't the best design, but I was in a hurry! In hindsight it would be better to have a loss push the player back to the previous NG+ mode (assuming they've won more than one consecutive run already) so that not quite so much progress is lost. That said, I'm kinda impressed/relieved with how well it turned out because there was only just enough time for some emergency band-aids, and into the final hours I was still making pretty huge improvements. It's not nearly Cogmind level of balance, but from a couple quick playthroughs I did identify the biggest issues and what was needed to quickly resolve them. Aside from repeatedly dropping the number of robots (early counts were way too high! ), I added lots of weapons across the board, basically hacking them into the normal item distribution system by forcing a minimum 15% of all individual items to spawn as weapons. 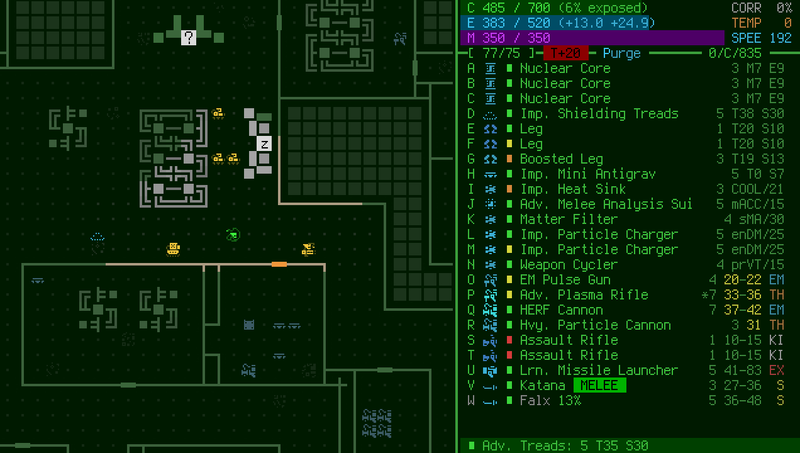 This is not normally how item distribution works, but after repeatedly running out of weapons during my test runs I used Cogmind's item distribution debug output system to examine the normal likelihood of having weapons spawn and noticed that the numbers were surprisingly low on most floors. Final (post-balance) distribution of items, both common and prototypes, by slot/type on each floor. In the same way I enforced a minimum weapon count, every floor is also guaranteed to contain launchers (more on larger floors), because launchers are FUN and I wanted the 7DRL to be FUN :D. Besides, in POLYBOT-7 players may not always have free slots to pick up the items they find/want (and remember there's no inventory space whatsoever! ), so even with a lot of fun stuff lying around, not all of it will actually be used, meaning there's more leeway to add plenty of it without making the game too easy. More weapons and other good items were also added in the form of guaranteed prefabs, specifically "weapon rooms" and so-called "build rooms." These are rooms that contain caches of out-of-depth parts, the former purely weapons (again to make sure there were enough to play with) and the latter having a balanced variety of items across the slot spectrum such that players who find these rooms could essentially purge right there to get a decent fresh build. "Build rooms" are guaranteed to have a power source along with some propulsion, utilities, and weapons. Special prefab rooms, labeled. Also notice how these rooms often have double doors so they're easily recognizable from the outside. One of the core mechanics was also changed at the last minute: the purge timer. At first it seemed like siphoning off a portion of the player's energy each turn to charge it would be strategically more interesting. This behavior would add another important consideration to any decision to purge, since the action would be followed by reduced energy production until fully charged again. But I realized this wasn't very desirable in the bigger picture, since purging already destroys random parts and can lead players into an uncertain situation, so there's no reason to kick them while they're potentially down! Instead I changed it to a simple 100-turn timer--more predictable, and also more fun. Purge timer in action. Counting down and repeatedly attaching remaining nearby items only to purge again. At the very very last minute I was testing the game out real quick and spotted some important QoL that was missing from the UI: the number of newly collected slots from the current floor (since there is a guaranteed number and these are a vital improvement to seek out), and even the actual letter of the current floor! Both of these are useful for assessing progress, and there was almost not quite enough room but I squeezed them in next to the turn counter. Aside from their usefulness to the player, HUD indicators like this also make screenshots a lot more informative when players are sharing them, avoiding too many basic questions and giving discussions more context to work with. 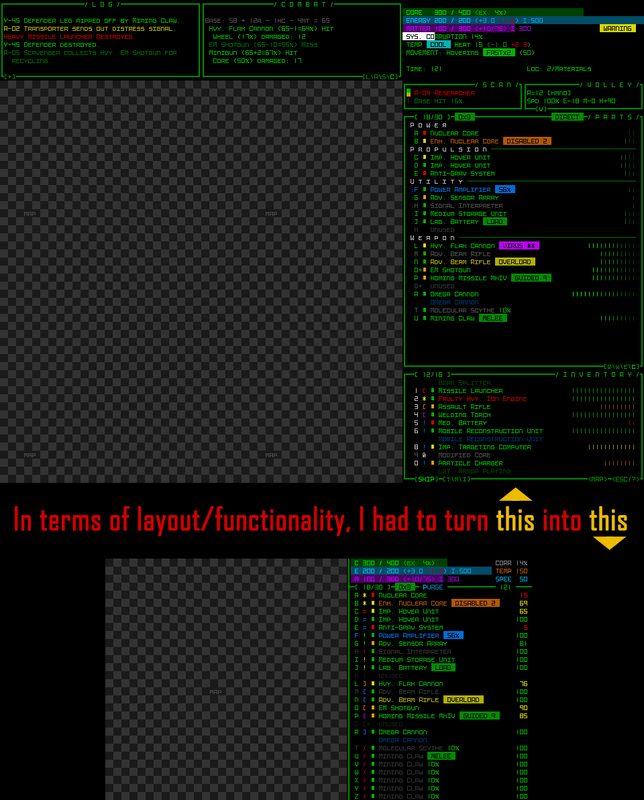 This is one of many advantages to Cogmind's "pretty much everything you need to know is visible on one screen" UI style, in addition to making it easier to get up to speed when continuing an unfinished run from a previous session. Although I'd finished on time in my time zone, I was working with Kacper and he needed the rest of his Sunday to finish the tileset, so I didn't submit until the next morning after I had a chance to wake up and package his tiles with the game. Shortly after release it was reported that you could still access the Garrison hacking interface by clicking on a Dispatcher xD. I'd removed the bump-to-hack interaction, but forgot that clicking on them is handled in a separate part of the code! Amusingly this meant players could hack open a Dispatcher, which created stairs to an oddly named floor, "G" (taking the first letter of "Garrison"), and it was technically a legitimate link to a garrison map but I had removed all the garrison data so attempting to enter would simply crash the game. I put out a fixed version real quick to avoid people walking into a black hole (not to mention the hacking interface wasn't redesigned for POLYBOT-7 anyway). Bug-enabled hacking interface opening a theoretical exit into a Dispatcher. Speaking of bugs, throughout development I discovered a number of them in Cogmind, and even the engine itself. Nothing major, but it's nice to have been able to clean those out, too. A good number of Cogmind players have picked up the game and are enjoying it. I heard from one even mentioning that it helped them understand Cogmind better! And it seems even non-Cogmind players have been finding it fun. In the first 8 days so far since release there have been 437 runs (not individual players, which is somewhat less than this) and... 882 downloads. Apparently a lot of people download to consider playing later when they have a chance. (I know there were some people who downloaded multiple times because I updated, but not quite 2~3 times per person :P) It would be fun to compile the stats and leaderboards like I do for Cogmind, but I've really got to focus on the latter for now! 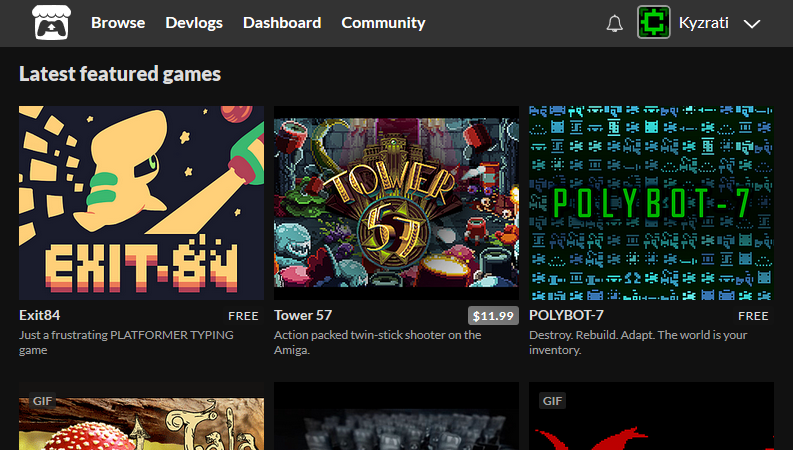 POLYBOT-7 featured on itch.io front page. Popularity is basically just page hits, of course, so it helped that I posted announcements on a number of sites, plus Nookrium, a decent-sized Let's Player who has tried out my other games, gave P7 a shot as well on day 1. I've kept an eye on Cogmind sales and there's been no significant impact there, but wishlisting on Steam is up 29.4% comparing the week before and after the 7DRL release ($20 is a bit more expensive than free, plus it's "Early Access" :P).